All flow metering systems, which are currently available, have their specific weaknesses, limiting their range of applications. 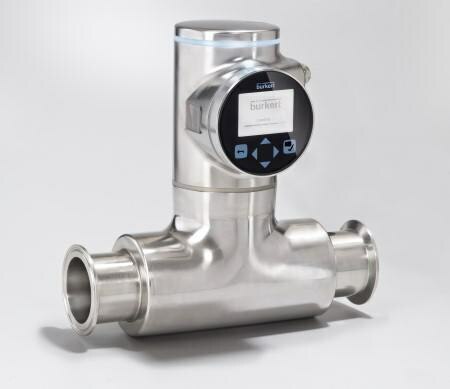 Consequently, Bürkert raised the question of what a perfect flowmeter for liquids should look like. Bürkert's new device called FLOWave comes very close to the answer. The new technology based on SAW (Surface Acoustic Waves), which makes this possible, will be first introduced at Hannover trade show from April 7th to 11th. There are flowmeters with a lot of different technologies on the market. Today, an electromagnetic flowmeter (EMF) type is a well established standard thanks to its broad range of applications. Devices are available in many variations. Ultrasonic and Coriolis flowmeters experience high growth rates, too. Still, each and every technology available today is fraught with its specific weaknesses and limitations so that selecting the most suitable one for a specific application is a challenge. The measuring task must be fulfilled, reliably, throughout the entire life cycle of the device. As well the daily operative handling effort should remain within reasonable limits. FLOWave indicates its device status at every time with a light being related to Namur NE107 definitions and does not require maintenance activities. Both allows to shorten downtimes resulting in remarkable lifecycle cost reductions for users. With this in mind, Bürkert set out to find a technology that would take account of all that and offer significantly more value to users. We believe that the new Surface Acoustic Wave Technology (SAW) fits the bill. The flowmeter relies on the propagation of waves for measurements, being similar to those present in seismic activities. One of the outstanding features of SAW for inline flow measurement of liquids is that it operates without any components or constrictions inside the measuring tube. The interior surface can be manufactured with the same surface finish applied to the rest of the pipeline. In terms of hygiene, cleaning and flow conditions, there are absolutely no differences compared to any other straight piece of pipe. There is no pressure drop and no effects of the fluid on sensor elements. No tedious selection process to come up with the best sensor variant. Maintenance is minimal if at all. Transmitter, sensor and measuring tube stand up to the highest hygienic requirements. Besides volume flow, temperature and density can be measured, too. Based on this data, the mass flow rate can be calculated. What is more, the new flowmeter principle would work even with stagnant liquids so that results are available even with the smallest flow volumes. It recognises quick flow rate changes - reliably - and is, thus, suitable for very fast filling processes. The high excitation frequency of 1.5 MHz avoids disturbances due to inherent vibration in the plant. Magnetic and electrical effects have no influence on measurements. This technology does not depend on the conductivity of the fluid, which significantly expands its scope of application. Certain effects, which may be caused in liquids due to gas bubbles or solid particles, are less pronounced with SAW, or can be detected with better reliability. Last but not least: SAW is the only flowmeter technology that can distinguish between laminar and turbulent flows. Implementing this technology leads to a compact and lightweight flowmeter. Installation may be in any position. The SAW sensor is an integral part of the measuring tube. It is connected to a transmitter which comprises the user interface and generates the required output signals. The transmitter is based on Bürkert's new electronic platform, which will be used by all future devices. The design is fully modular, which allows for a multiple and diverse use of all individual components. The connection of the electric sub-assemblies is no longer analog, as in the past, but fully digital. Bürkert uses CAN open with extensions, which allows the design of network topologies and, thus, helps us to fulfil our claim to offer even complete solutions and ready-made systems with full flexibility and customised to user requirements. Volker Erbe, product manager for sensors at Bürkert, recommends the SAW technology especially in those cases where, so far, low or non-conductive fluids excluded electromagnetic inductive sensors and forced users to opt for much more expensive Coriolis devices. Montreal Sales Center Burkert Canada Inc.